Papercraft – a new handmade trend. I'm a creative person and always look for new ideas, I like learning something new. The coolest thing I've found lately is papercraft: in short, you print out the template on paper and using glue make the belter volume sculptures. Guests really like it, they do not understand how and what it's made of, they want to have them too 😊. You can make and gift them, all will be delighted I’m 100% sure! After that, I was very interested in papercraft, and it turned out that quality templates are so difficult to find. The majority of them are hard to make and some cannot be glue at all. By the way at that time I was already professionally engaged in 3D graphics and interior design for 15 years. And in general, I set a goal to learn how to make good quality templates. And, of course, they should look cool in the interior! I have spent a lot of time on it, but I do not regret it at all. Now I have created more than 40 templates. They are easy to make, with remarks where necessary and step-by-step instructions. They are easy and interesting to glue together. How to make a 3D sculpture with your own hands. As a beginner select templates with difficulty level Easy, they can be made without any experience at all. The difficulty level is specified in the description of each template. For example, you select a flamingo, pay with Paypal or CC. After purchase, you immediately receive a link to the template in PDF. Each page of the template shows the color of the paper on which it should be printed. But you can choose your color. It is better to use a paper with a weight of 160-300 gsm. Format A4, or US letter. The simplest way is to write the PDF to a USB flash drive and go to the nearest print shop. They have paper of different colors and weight, and they will print it out. Then, we need a scissors or a stationery knife, a ruler and PVA glue. Also we need a tool for folding (for example a pen without ink, or the back of a knife). 3. Now we need to glue the parts together in a certain order (on each part there are large numbers showing us the order). There are small numbers at the edges of the parts – find the same and glue them together. The side of the paper with the print information remains inside the model. And in such way glue together all parts of the sculpture. Look how your model becomes more and more complete. When you make your first model – you will understand how easy and interesting it is! The sculpture is done, you only need to find a place in the house where it will have the coolest look! Which templates are better to choose? Each experienced papercrafter will tell you that a quality template is at least 80% of successful result. So, you only need to use proven templates. Thus, I make the easiest and the most quality models and templates for making, without errors and faults. My clients have made them more than 400 times. I'm always open to communication, you can contact me at any time at Etsy or Facebook. PS: Now you know how to make a paper 3D sculpture yourself. It is clear that knowledge without practice is absolutely useless thing. 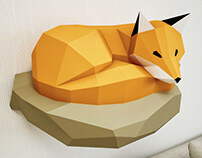 Papercraft – a new handmade trend. How to create 3D paper sculptures with your own hands?